Still, there is so much to do in those initial few weeks of settling in a new country, that keeps you busy. Meet with your relocation agency, go see apartments or houses and decide where you want to live, open up bank accounts, get national ID cards, settle the kids in school, get a car or a public transport pass, wait for your international container shipment to arrive, only to have your husband announce he’s leaving for his first business trip exactly then, so you’ll be the one unpacking and setting up house AGAIN. It’s usually once the initial dust settles, that you begin your second stage of expat life – where you think, right well what should I do now? Getting out there again, can be incredibly difficult. Trying to make new friends when all you really do is miss your old ones. It took you forever to find a good hairdresser, a trusted gynecologist and a decent coffee place that serves your flat white just the way you like it, and now you have to start the process all over again. Teaching yet again another Starbucks barista to correctly spell your name (it’s not Marion, it’s not Miriam, just Mariam thankyouverymuch), can be the straw that makes you want to pack your bags, again. It’s enough to make anyone want to throw in the towel and have a good cry, right? So why do I keep signing up for the same gig, over and over again? Why do so many expats keep on expatriating? What draws us habitual or long term expats to this way of life? The biggest factor for us of course is the fact that my husband and I both consider ourselves as part of the global workforce, and a huge part of this is tied to mobility. Being geographically mobile has paid huge dividends for his career and propelled mine to acquire equally diverse experiences and the chance to make an international career change. This year there were talks of sending us “back home” except none of us knew where that would actually mean. Still, if we wanted to, we could take ourselves out of the “expat game” and just go back to any 1 of the 4 places, my husband and I grew up in /call home. But so far, we haven’t done that. 15 years, 7 countries, 3 continents, 2.5 foreign languages and 2 kids (and many international adapters) later, I still love being an expat. Expat life has helped me to redefine my comfort zone. Each time we move, there’s a new country to discover, a new city to fall in love with, a new grocery store to conquer, a foreign culture to understand, a new language to learn, and a new region of the world to travel and discover. Somehow our sense of adventure is not yet finished and we realize that settling down in one place sounds both appealing and incredibly scary at the same time. Each time you push yourself a bit further out of your comfort zone, you’re amazed to discover things wholly unexpected about yourself. I realized I could indeed start biking in morning time rush hour in Copenhagen to get to work and learn the complicated hand signals to go along with it. Once I got over my fear of trying a work commute the Danish way, I realized how much my fear was holding me back and how liberating it felt to try something new. Expat life has taught me how to thrive in adversity. I understand that part of this whole expat experience is being able to reach deep within yourself and develop new skills to be resourceful, no matter where you are. Expats are great at developing their own survival skill set. With each expat posting, they figure out what are the key things they need to make their new expat adventure a success. I figure out how to function without a manual. I learn the do’s and don’ts about a new place by experimenting, not being afraid to make a mistake or two, and I reach out and ask other expats for valuable tips or insights they can share with me. I know the importance of building my own support network in a new country. I make time to meet people, I say yes each time someone invites me, and I actively seek groups and activities to join which will help me feel settled and make some new friends! I find one special place that makes me feel calm and helps to clear my head; a place that provides solace and comfort when I need it the most. In Singapore, I would always retreat to the Singapore Botanic Gardens when I was having a bad day. Walking through its tropical lush greenery, under shady trees and joining in a spontaneous Tai Chi class would help on almost any given day! I also find one hobby or interest I can continue no matter where I am. For me this has to do with my love for reading books, so I either usually join a book club or start a book club, as I did in Dubai. 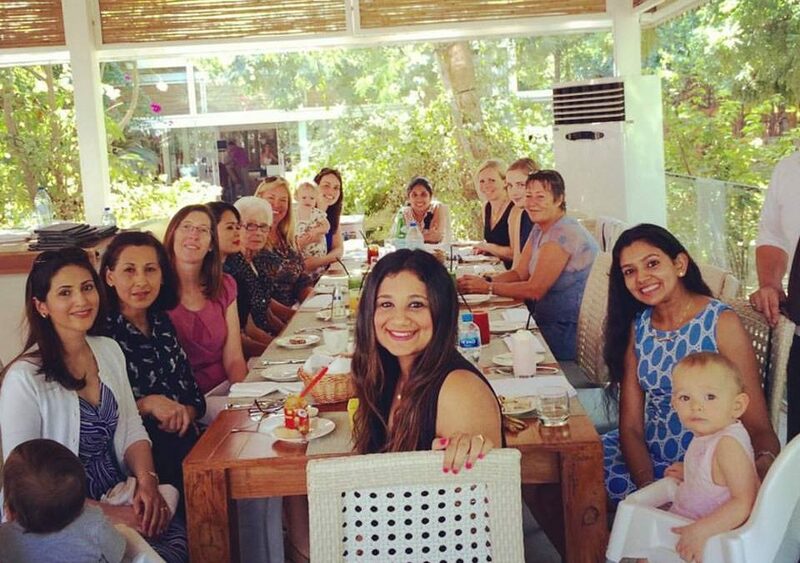 I absolutely love my Dubai book club; 8 international women from all over the world, it is fascinating to hear everyone’s very diverse and interesting opinions on the same book. Expat life has definitely made me more daring. I felt pretty daring eating pickled herring (definitely an acquired taste!) in Copenhagen. And I felt brave driving in crazy rush hour traffic in Houston, along with a bunch of Texas cowboys (interestingly this skill has served me surprisingly well in Dubai, where the craziness is on a whole different level). Expat life has helped me learn different languages, different accents and even different slang. I learned that when a friend in England ask “You, alright?” he/she is not expecting some detailed response, but just a simple “Yep, good. You?” Or that when my Aussie best friend in Singapore would text to ask “hey are you free for a coffee this arvo?” that meant sometime in the afternoon. And who knew that I would actually stalk a Danish couple down Orchard Road, just because I overhead them speaking Danish; a language I had spent 5 months learning, and 4 years massacring on a daily basis? A language I struggled with, but which now reminded me of the home I had just left behind. (Coincidentally, this Danish couple led me to one of the nicest Danish café’s in Singapore, where I could at least be guaranteed a Danish pastry!). Expat life has made me deeply appreciative of so many different cultures around the world. I understood the cultural significance of exchanging oranges over Chinese New Year (they are the symbol for good luck), and I learned the importance of Thanksgiving as part of American culture (this is when my addiction to pumpkin pie and pumpkin spiced lattes truly began). I realized that no phrase warms the heart of a German more than to hear “Alles in Ordnung” (everything is in order). The Germans pride themselves on their efficiency, organization, discipline, cleanliness and punctuality; these are all manifestations of “Ordnung” (order), which basically means a bunch of good things. I learned Italians are more likely to tolerate a corrupt politician, but would never tolerate a bad cook. And I learned that the best quality to have in the eyes of a Dane is humility. Danish culture is built around the concept of ‘Janteloven’; the Danes believe in order to maintain a truly egalitarian society, you must not try to differentiate yourself from others, but rather align your good to the social good. They would not brag about their education, their talents, and their promotion at work or the big shiny car they just bought. Possibly the worst thing you can be called in Denmark, is a “blærerøv” (a show-off). Expat life has taught me that no country is perfect. Every country has its pros and cons and the best thing you can do is to approach living in any new country with an open mind and a willingness to learn. Expat life has shown me that we are all more alike than we think: We all want the same things in life: the opportunity to succeed, to give our children a good future and to enjoy life. Expat life has made me realize the importance of friendships: The best part about living abroad are all the wonderful people you meet and the amazing friendships you foster. Expat goodbyes can test a friendship, but knowing you have a friend to crash with in Buenos Aires or Toronto, can really help when you’re planning your big South and North America trip. Expat life has underscored that our world is a beautiful place. Some of my most favorite travel experiences have been being blessed by Monks while temple trekking in Cambodia and being caught up in an elephant parade in Northern Thailand. Getting lost amongst sheep in New Zealand, laying eyes on Petra for that magical first time, and visiting the idyllic Greek island of Corfu, in the footsteps of my favorite English expat and author Gerald Durrell (My Family and Other Animals). Expat life has taught me to fight for the things I believe in. Things like tolerance, empathy and respect for one another, multiculturalism and diversity. Expat life has taught me that I am me, no matter where I am. I’m the same person in the Arabian desert that I am in Scandinavia (perhaps dressed differently, but the same nonetheless). It’s made me realize that what Shakespeare said is so true: “to thine own self be true”. When I strip away culture and norms and societal expectations, all I’m left with, is me. Expat life has directly shaped my family into who we are today. Expat life introduced me to my husband, expat life gave me 2 wonderful children, born in 2 different countries (with a Chinese birth certificate and an Arabic birth certificate) and expat life is responsible for all of us learning to feel at home no matter where we are in the world. Being an expat has shown me how privileged I am, to be able to experience so much of our amazing world. And this is why I am still not done with expat life. The gifts it continues to give me far outweigh the havoc it plays on my sense of identity (and my kitchen appliances). This is the reason why I say “yes” each time to a new expat adventure. I love the constant process of making a place a home, and raising my kids with several different languages and cultures. I love the spice, variety, fun and unpredictability it brings to my life. I love the way it makes me want to get up in the morning looking forward to a new adventure. I’d choose adventure any day. Hi! I love your blog and, if you allow me, I would like to translate this post to Portuguese to publish on my blog – of course, giving you all teh credits. Reading this made me realise we will never “settle down” yet we do that over and over, don’t we? I also met my husband on the way, have a birthday certificate from China and one from Hong Kong. Your favorite Danish pastry cafe in Singapore is most likely that of a talented Kiwi married to the best friend I made in Shanghai. I wake up to emails and text messages from around the world, requests for Facetime coffee and Bookclub friends asking “where are you now and more importantly what are you reading”. The more I see of the world the louder is the call from places I haven’t conquered yet. I look forward to our paths crossing one day! Oh wow, lovely to hear from you Søs and yes we have so much in common 🙂 The world can be a small place after all! Where do you currently live? I completely relate to seeing more of the world and hope very much our paths may cross one day! You are very priveleged. Not only amazing opportunities but also a relocation agency and international shipping. I work for NGOS so get one fare paid and no relocation/shipping. Hi Karen, thanks for reading! Yes, incredibly fortunate that for our recent moves, we have been offered relocation services and shipping. My husband works for an international shipping company, so thats a huge benefit. The norms vary greatly depending on the industry for sure. Expat packages are slowly becoming a thing of the past, and depend a lot on the location too.